This week I am using the Druid Plant Oracle deck by Philip and Stephanie Carr-Gomm. I am going to pull two cards as they are long detailed cards. Firstly, I will use my intuition for the first part of the message and combine it with the authors' teachings of the card. I will also put a photo of one or both cards up. Now stay with me while I pull the cards!!! Ok so the first card is CUCKOO PINT. What is coming to me of course is that the cuckoo puts her own eggs into other birds’ nests, to be hatched. So some people may be letting others take their responsibilities. This may be you not pulling your fair share of the weight or others at work or at home not pulling their weight. It is a time to decipher what responsibility belongs to who, in relationships and in situations that aren’t working out too well, in your life at the moment. Should the work load be 50/50? Are you the boss at work and should you be doing more to support your staff? Or is it the other way around? Are you doing more than your fair share while the boss or others aren’t carrying the responsibilities that they are being paid for? In personal relationships, how are they working out for you? Are you the one who is holding it all together? Are you the one whose words are falling on deaf ears, or are you the one who isn’t listening, letting all the emotions fly over your head, thinking it will all be alright when the other person calms down? Whatever your situation, it will all rise to the surface at some stage to be brought to the light, so is now a good time to have a look at it and change what you have been doing over and over which hasn’t been working? Either becoming the listener or the speaker, whichever you haven’t been doing already? Very deep message coming there this week. 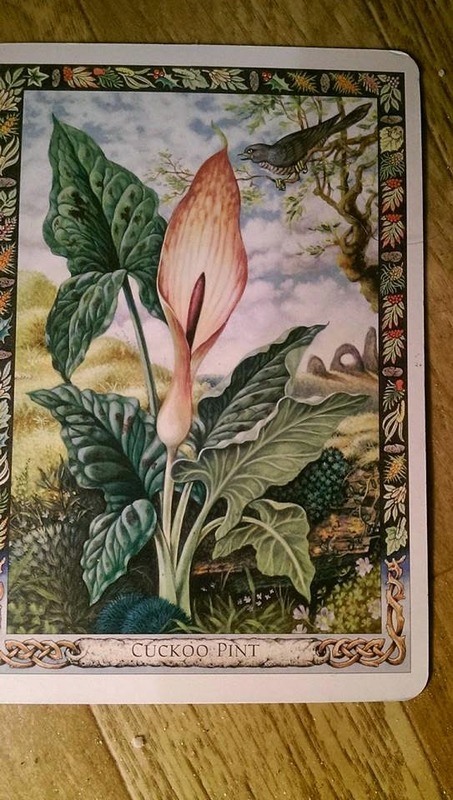 So the message from the book says that the two parts of the cuckoo pint plant are the chalice and the blade. This symbolises at one level the union of man and woman but at a deeper level, the union of our own masculine and feminine aspects within ourselves, which is sometimes called the Mystical Marriage or Alchemical Wedding. This card can have both those meanings, a time of profound harmony and union with the person you love or a further healing and integration of the male and female aspects of who you are. Whichever it is, this is a time of great creativity and fertility for everyone. The rest of the message is about disharmony and your message will be triggered by the answers to the above questions. So I have just looked up information on the cuckoo and it says that some cuckoos let others rear their young, but the majority rear their own!!! Just to be clear on it. 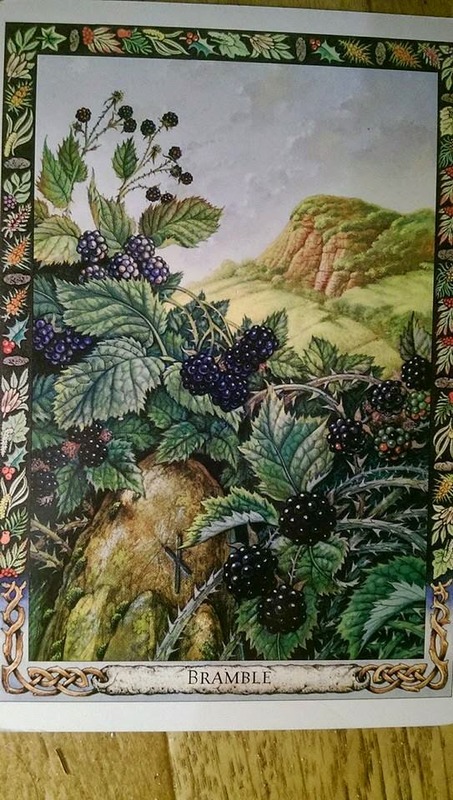 The second card is the Bramble. In the picture it is the blackberry bush that is featured so of course, many of us have picked blackberries in the summer when we were children. So we had to make our way through and around the briars or thorns to get to the lovely juicy blackberry. Of course you can see where I am going with this!! The rough and tough times in our lives have to be navigated through before we get to the beautiful fruit. So the blackberries flower and become ripe in the summer months and since it is summer in some countries at the moment and this is a reading for this week, I am taking it that this week is a very important week for all of us. For some there will be actual physical important happenings, for others it will be shifting of old thought patterns or meeting people who help you see life from a different perspective. Whatever way it works out, it is all for everyone’s highest good. Just be aware that you have plenty of help from Spirit as you always do, but this is a strong energy week of movement on many fronts. Now the message from the book is very interesting. It talks about the roots of the bramble and how they are tenacious, deeply rooted and travel long distances. It’s not going anywhere and it’s not going to be pushed around!! So it is all about boundaries. Your own boundaries and other peoples’ boundaries. It is possible that you are holding your ground, digging your heels in and aren’t moving an inch. It is also possible that another person or situation that is “prickly” and stubborn is represented by this card too. It may be necessary to remember how difficult it is to remove a Bramble from its position and how – at the right season – it can yield delicious fruit that is full of goodness. Knowing our own boundaries is vital to our emotional and spiritual health, and when it comes to relationships, being sensitive to other people’s boundaries is vital, too. Often, provided we respect their boundaries and when necessary leave them alone, they will in their own time be generous to us. So it is a message of giving and receiving, of balance, of knowing your own boundaries and if necessary, letting others know when and if they are infringing on them as well as asking others, if you aren’t sure,- if you are invading their space. Which brings us right back to the beginning of the message, which spoke about it being time to change the dynamics. So there is a lot to mull over this week, if situations or relationships are somewhat, or a lot out of balance. Take some quiet time to feel your feelings on it all, and to find your own honest answers to the questions. As the week goes on, you will know if you need to take action, have conversations or just step back a bit, if you have been trying too hard, pushing and not making any progress.